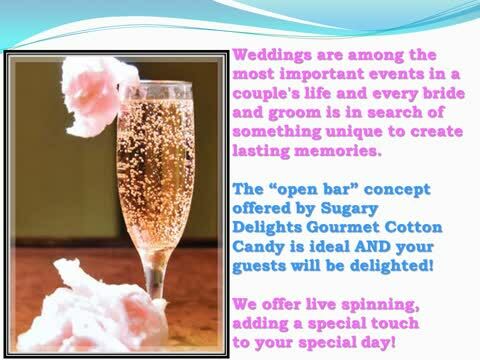 Sugary Delights is ideal for a variety of special events and appeals to any audience. We customize services based on your specific needs and preferences. will make your special occasion even more memorable and fun! Please allow a minimum of two (2) weeks advance notice on bookings. A minimum deposit of $50.00 is required to secure our services. Out of area surcharges may apply. Let us bring a flavorful and unique twist to your event. catering to a variety of events. contact us today to reserve your date and time!! We're pretty proud of what we have to offer! bride and groom wants the perfect wedding. a unique spin on the open bar concept? adding a special touch to your special day! Contact us today to reserve our services. has a vested interest in the Rochester area. will give back 20% of all sales. Contact us today with details of your fundraising event. because we do the work for you! Looking for a unique party favor? A tasty gift? Or a fantastic idea for swag for your corporate event or conference? - now available in two sizes! Your choice of any flavors! Contact us today to place your order and for delivery options. Please allow 2 weeks advance notice. Gift certificates are also a great idea!